Figure 1. 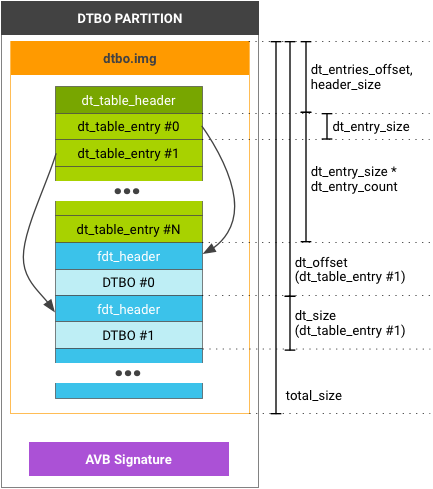 Example dtb/dtbo partition layout (for AVB signature, see Security). The dt_table_header is only for the dtb/dtbo partition; you CANNOT append this format after the end of image.gz. If you have a single DTB/DTBO, you must still use this format (and the dt_entry_size in dt_table_header is 1). uint32_t version;       // DTBO image version, the current version is 0. // dt_table_header struct is updated. The id, rev, custom in dt_table_entry are optional hardware identifications of the device tree the bootloader can use to efficiently identify the DTB/DTBO to load. If the bootloader requires additional information, put it in the DTB/DTBO where bootloader can read it by parsing DTB/DTBO (see the sample code below). The following sample code checks the hardware identification in bootloader. The check_dtbo() function checks the hardware identification. It first checks the data in struct dt_table_entry (id, rev, etc.). If this data is not enough, it loads dtb data into memory and checks the value in dtb. The values of my_hw_information and soc_id properties are parsed in the root node (example in my_dtbo_1.dts). mkdtimg is a tool for creating dtb/dtbo images (source code at system/libufdt in AOSP). mkdtimg supports several commands, including create, cfg_create, and dump. For example, /board/:id. mkdtimg reads the value from the path in the DTB/DTBO file and assigns the value (32-bit) to a relative property in dt_table_entry. Alternatively, you can give a global_option as a default option for all entries. The default value of page_size in dt_table_header is 2048; use global_option --page_size=<number> to assign a different value. First dt_table_entry (board1.dtbo) id is 0x00010000 and custom is 0x00000abc. Second id is 0x00006800 and custom is 0x00000abc. Third id is 0x00006801 and custom is 0x00000123. All others use the default value (0). Options global_option and entryX_option must start with one or more space characters (these options are the same as create options, without the -- prefix). Empty lines or lines beginning with # are ignored. mkdtimg does not handle alignment for .dtb/.dtbo files but rather appends them to the image. When you use dtc to compile .dts to .dtb/.dtbo, you must add option -a. For example, adding the option -a 4 adds padding so the size of .dtb/.dtbo aligns to 4 bytes. Several DT table entries can share a .dtb/.dtbo. If you use the same filename for different entries, it stores only one content in the image with same dt_offset and dt_size. This is useful when using different hardware with identical DTs.